Recent thinking about an older painting. 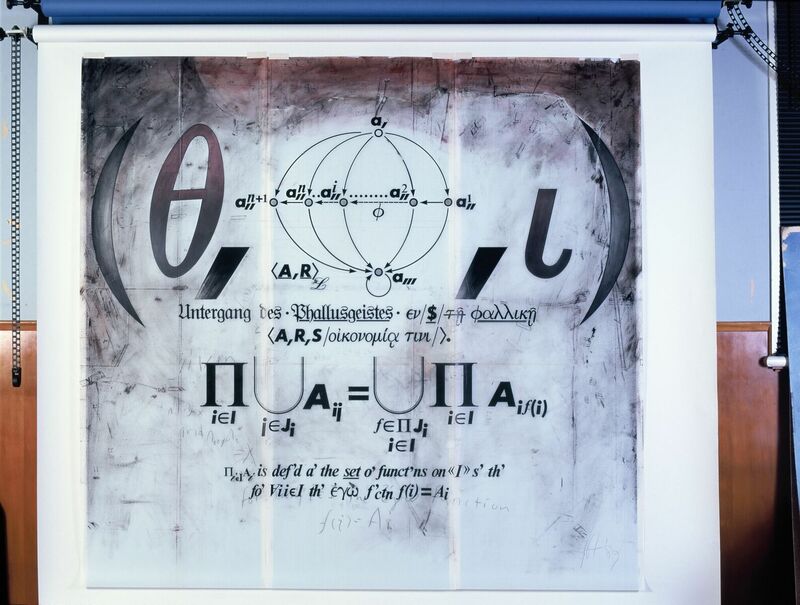 In his own intractable way, Badiou bound ontology to the language of set theory with such determination that it is difficult to think how mathematical reasoning could not avoid collapsing into metaphor every time it is evoked in the service of French philosophy. I donâ€™t blame MallarmÃ© for this, but I do blame the way Badiou evokes his name and then repurposes mathematics by turning it into philosophical poiÃ«sis. In the late 1980s the â€œsemioticsâ€� of set theory and possible-world semantics held a special theoretical interest for me. Something meaningful about mathematical thinking could exist outside the authoritarian reach of its syntax and, as I would learn later, reach well beyond the limits of Badiouâ€™s set-theoretical ontology. Functor categories whose objects are categories of large sets is the principle mathematical metaphor for this. The above image is almost thirty years old. Its textual content combines set theory with coalgebra, albeit in a modal logic form. All modal logics are coalgebras, although I didnâ€™t know this in 1988. In 2009 it occurred to me that Badiouâ€™s set-theoretical ontology and theory of singular occurrences, which he called â€œevents,â€� could be mathematically restructured as terminal coalgebras over categories whose objects are large sets (i.e. proper classes). Large sets are inconsistent; i.e. their existence violates the axioms and rules of classic set theory. Assertion: large sets constitute the sites of Badiouian events. For Badiou, a singular occurrence is an ontological inconsistency. If the ontological stuff of events are proper classes, then their temporal persistence will radicalise a situation and its subject to such an extent that any subject may not only endure an event per se, but that subjects may actually reconfigure the status quo. Subjects of events may indeed form new communicative bodies (apropos Badiou). But under the rubric of new beginnings, such bodies become unburdened by the apostasy of ontological inconsistency. Thus, the Badiouian notion of faithful subjects becomes redundant.